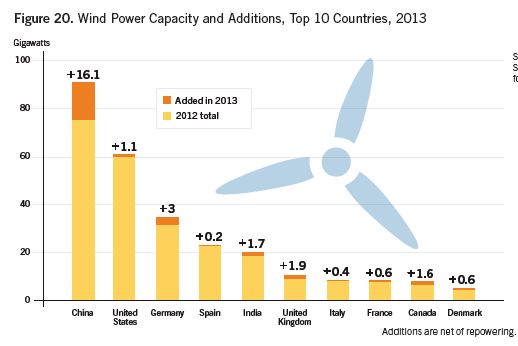 We see that China surpassed every single country in wind energy production, except the United States. But these statistics are up to 2009 only. So my question is: what about today in 2014? Did China equal or maybe even surpassed the United States? According to the REN21 Renewables Global Status Report 2014, China had 91.4 GW of installed wind capacity by the end of 2013, more than any other country in the world, of which 75.5 GW was in commercial operation. The USA had 61.6 GW of installed wind capacity. In terms of actual generation from wind, the USA was world leader in 2013, with 19.4 GW mean power (170 TWh, IEA Energy Balances 2014); China was second, with 16.0 GW (140 TWh, REN21 Global Status Report 2014). Note that this is installed capacity, not electricity generated. Capacity factors (the ratio of mean power generated to installed capacity) vary over time, due to inter-annual variations in weather; they also vary by country. So just because one country had a higher installed capacity, does not always mean that it generated more electricity from wind. The IEA data (Renewables Information 2014) for 2013 says that the USA generated about more electricity from wind, in absolute terms, than China did (USA 19.4 GW mean power, China 16 GW mean power - the latter figure is from the REN21 GSR2014). So in absolute numbers, of amount of electricity generation from wind, the USA was the world leader in 2013 (the most recent year for which comparable data is available). Higher capacity factors, less curtailment from transmission bottlenecks and grid controllers, and more readily available transmission infrastructure, are all parts of the explanation for this. Getting trustworthy statistics out of China is very difficult: in many reports, you'll often find that the statistics from China come from personal correspondence with specific Chinese bureaucrats. In addition, China does things differently to a lot of other countries, including the USA. In China, wind plants often get built before there's a suitable grid connection available for them: they build the transmission network once the windfarms are built. It usually works the other way around in the USA and many other countries. 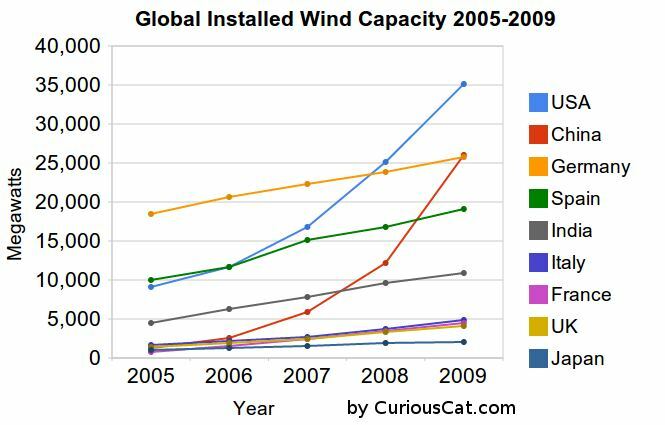 So GW of wind capacity installed can be measured on a different basis in different countries. Not the answer you're looking for? Browse other questions tagged energy electricity wind-power renewables statistics or ask your own question. What is a good database containing wind speed and direction?